Wireless freedom for your AzBox receiver! 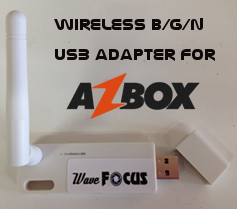 The WaveFocus Wireless USB Adapter for AzBox HD receivers allows you to enable wireless connectivity for your AzBox Elite, Ultra, Me (*) or miniMe (*) without any special software or drivers. This is a true wireless adapter and not a bridge so you will be able to connect to wireless networks directly from the AzBox user interface as if you had a Premium or Premium Plus model. Wireless B, G and N networks are supported with a maximum speed of 150 Mbps. (*) Me or miniMe requires version 1.85 or later of AZtrino North American edition in order to operate.